Dr. Justin DeHart is an avid performer and dedicated teacher of a wide variety of musical styles - from classical to pop, and from world to electronic. DeHart’s musical resume includes performances with the San Diego symphony, pipa master Wu Man, and various pop legends, including Cheap Trick. As a California native, he holds a B.M. from CSU Sacramento, a M.F.A. from California Institute of the Arts, and a D.M.A. from UC San Diego. DeHart was awarded a Fulbright Scholarship for percussion studies in India (2001-02) and his talents have been featured at concerts around the globe. He recently accepted the position for Senior Lecturer in Music Performance at the University of Canterbury, in Christchurch, New Zealand. 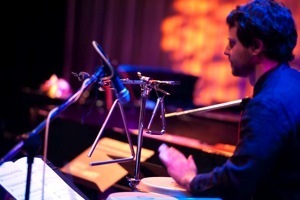 Justin DeHart is a Yamaha Performing Artist and an endorser of Black Swamp Percussion, REMO, Sabian, and Innovative Percussion Inc.